Admit it -- you're addicted to makeup palettes and to eyeshadow primers. Well then, you're in luck -- because the new Urban Decay Ammo Palette seems to be tailor-made for you! I myself am hard-pressed to say anything but amazing things about this duo, as I am totally in love with Urban Decay shadows and the primer potion is to die for! 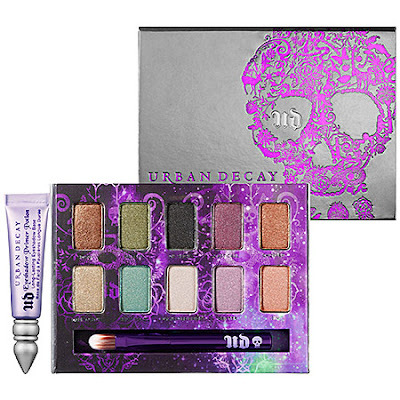 Beauty junkies everywhere rave about the Urban Decay Primer Potion. A swipe of this across your lids makes your shadow stay put all day long without creasing. It's seriously miraculous! I held off on trying this out for a long time -- I chalked it up to another one of those beauty myths that just simply couldn't be true. But I was amazed at how much longer my shadow stayed put when I finally tried it! With these 10 colors, you can highlight, shade and shadow to your heart's content! Just don't forget to use the Primer Potion first. The set retails for $34 at sephora.com. Your eyes won't know what hit them!